David L. McGuffey is in private practice with the Elder Law Practice of David L. McGuffey, LLC, located in Dalton, Georgia and in Cartersville. David limits his practice to Elder Law and Special Needs Law. This means he helps individuals who are elders or who have special needs, as well as their caregivers. Much of David's practice is devoted to helping individuals with chronic health conditions find, get and pay for good long-term care. David is certified as an Elder Law Attorney by the National Elder Law Foundation. David is AV rated by Martindale-Hubbell. In 2012, David was invited to join NAELA's Council of Advanced Practitioners. 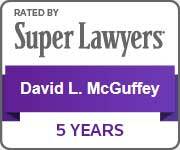 David has been selected as a "Georgia SuperLawyer" in the field of Elder Law for 2013-2019. David attended Georgia State University (B.A., 1987; J.D., 1993). He is a member of the National Academy of Elder Law Attorneys and various local bar associations. He is a past Chair of the State Bar of Georgia's Elder Law Section and the Tennessee Bar Association's Elder Law Section. David served as Chair of one of the American Association for Justice's national litigation groups from 2006-2007. David holds memberships in other groups associated with elder advocacy. David is a former member of the Board of Directors of the National Academy of Elder Law Attorneys. In addition, he serves on various committees for special interest groups working for Elders and Individuals with special needs. He is a former member of the the Board of Directors of the National Elder Law Foundation, Board of Directors of the National Consumer Voice for Quality Long-Term Care, the Board of Governors for the Georgia Chapter of the Alzheimer's Association, and the Northwest Georgia Health Care Partnership. He has served as an advisory committee member for Ross Woods Adult Day Care Center and the Ethics Advisory Committee for Alexian Brothers in Chattanooga. David is a Christian (Presbyterian). His core beliefs generally follow those states in the The Apostles' Creed. Although we do not impose our beliefs on anyone, if religious values are important to you, then we will attempt to incorporate them into the planning process upon a client's request.